Preheat the oven to 175 degrees Celsius (350 degrees Fahrenheit) and grease a 7 inch tart pan with a removable bottom. Cut the butternut squash halves into very thin slices. Leave them lined up as you cut them, this will make it easier to assemble the tart. Fan the butternut squash slices out on the cutting board (as seen in the photo above) and then lift them up in sections and lay, cut side down in the tart pan. Continue working in circles until the entire pan is filled. Squeeze slices into any gaps so that it is full packed. Brush the butternut squash with the oil and herb mixture and place the pan on a baking sheet. Bake in the oven for 25 minutes, watching to make sure that the top doesn't burn. Half way through baking, remove from the oven and brush with more of the liquid. 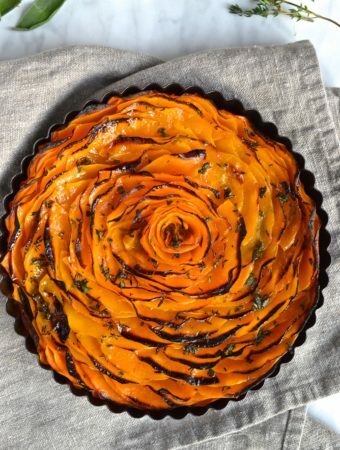 The tart is done once the squash are golden brown in colour and tender. Before serving, brush each squash half with the remaining liquid and sprinkle with the chopped pecans or thyme. To serve remove the outer rim of the tart pan and cut into slices.